The fifth year of the Sage Burner 25/50km trail race was run by the WSC Track & Field program as its been passed around by the local organizing team of Gunnison Trails aka (Dave Wiens & Co.) who operates the widely successful, 32/64mi Growler. A gallery of race Sage Burner photos can be found here. I candidly don't have the same passion for trail running as I do for ski touring, but it allows me to get up in the mountains where bikes often can't go....and its great off-season training for skimo racing. That being said....this is a local running race on a great section of trails I know & love well, so why not give it a go? (I've done it three other times, so this wasn't my fist Sage Burner). This year I decided to run in the new CAMP Trail Vest 10L (even though there were five aid stations out on course)....mainly because I wanted to carry a water bottle and fill up as I go. Many different ways to carry a bottle on course; a hand held system, on your waist, or with this pack...in the designated slots near your chest. The rest of the pack was a complete over kill for this race scenario but I didn't "pay a weight penalty" because the pack only weighs 365g. The pack is designed on the popular "vest concept" that is becoming quite popular. I used this concept over the last seven years from Salomon's line as a former adventure racer and really love having food, drinks, maps etc. easily accessible on my chest area. Combined with the way it suspends the load snugly across the chest, shoulders and waist makes for a great pack! The beauty of the pack is that it works in harmony with the CAMP Action Bottle with its 4" hose means all you have to do to get fluids is bring your chin to your chest and pull off of the "straw". Once again, the bottle was a great option for this race as I only had to carry 4-10oz in my bottle between aid stations vs. a bladder where I would have to stop and pull it out to be filled and put it back in the pack...a painfully slow process. The other option is to carry 30-50oz in the bladder for the race and not stop...but why carry the extra weight if you don't have to in this scenario? The pack will be great for runs over to Aspen or bagging peaks this Summer....it fits the fast & light philosophy for a pack. The shoes I used were the SCARPA Sparks . I've been running in them since the Grand Traverse this Spring. I wear a mondo 30 SCARPA Alien ski boot and went with a Euro 47 (same size as my old Salomons) to have a little extra toe box room in this shoe (this is the first trail race I can recall where I didn't loose a toe nail!!). The past several years I've been running in a Salomon Speed Cross ( ~285g size 9), which is light and svelte fitting for my trail running exploits. This new Spark (269g size 9.5) has more toe box room, better toe protection, better protection from rocks, all without a big weight penalty! The 6mm midsole drop is also quite enjoyable and gives me a "lower to the ground" feel for better stability/balance vs the Speedcross which felt slightly higher off the ground. Plus the Speedcross had a "mushy feel" on harder trail/mountain surfaces...it was a great choice for wet trail conditions, but not so favorable when up in the mountains on rocky terrain for long distances (you felt every rock!). This Spark is a great choice for mountain runners who are looking for an aggressive tread, light weight alternative to the main stream shoe companies. SCARPA has been making footwear for the mountains since 1938 and hit a home run in their debut, with this minimalist mountain running shoe. So how did it all add up for me at the finish? 2nd place ....the last 45 minutes I paid dearly as I clearly I need more "miles in my legs" to feel better here. The hydration/nutrition seemed good, just more Km in these "skier legs". 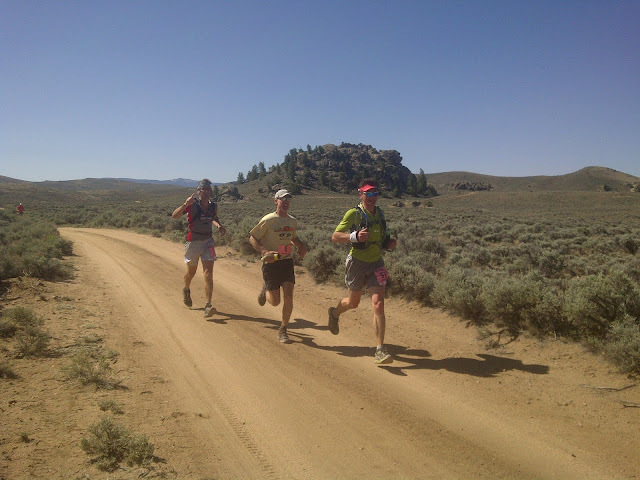 Next up will be the Grand Traverse "fun run" from CB to Aspen July 21st. Until then.... I hope to get up high in the mountains a number of times as the snow is melting WAY TO FAST...ugh.